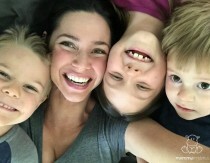 Heather Dessinger 42 Comments This post contains affiliate links. We all know about the rock stars of cold and flu season – elderberry syrup and fire cider – but have you ever heard of their less famous band mate, ginger syrup? While historically it was very expensive – one pound cost as much as a whole sheep in the Middle Ages – these days it’s widely cultivated and very affordable. (source) I like to keep it on hand during the cold winter months along with other syrups, tinctures and teas that support the immune system. 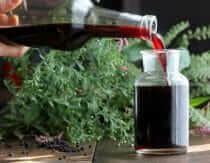 While technically this is a tutorial for making elderberry syrup, the process is EXACTLY the same. Just substitute ginger for elderberries and you’re good to go! 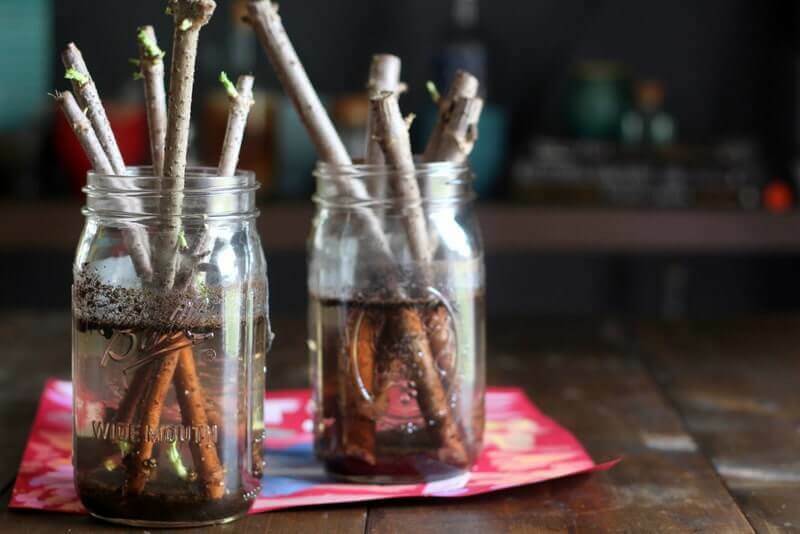 Add water, ginger and cinnamon stick (if you’re using it) to a pot and bring to a boil. Reduce heat and simmer until liquid is reduced by half. This should take around 45 minutes. Strain to remove ginger. Allow liquid to cool to room temperature, then stir in honey. 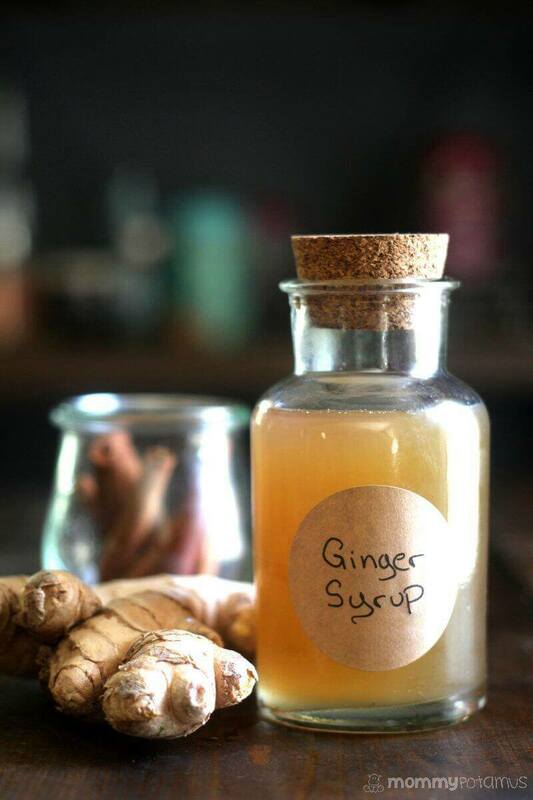 Transfer ginger syrup to a jar and store in the fridge. Because this recipe contains honey, it should not be used in children under one. According to Rosemary Gladstar, the syrup should stay good from several weeks to months. If you are concerned that you might not be able to use it all in time, you may want to cut the recipe in half or freeze some in an ice cube tray for later. 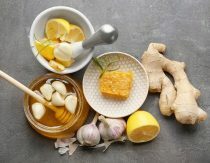 Could you use ginger root powder or crystallized ginger? This looks great. Could you used with vinegar to make a vinaigrette? Also, how long does it stay good in the fridge? Thanks! According to Rosemary Gladstar, the syrup should stay good from several weeks to months. If you are concerned that you might not be able to use it all in time, you may want to cut the recipe in half or freeze some in an ice cube tray for later. Do you use dried and fresh ginger or just one or the other? I make a ginger-lime syrup for hubby and I all summer long. We drink it mixed with spring water instead of lemonade. Very refreshing on a hot summer day. I was just thinking that the batch I made this week would be the last one ’til next summer. But if it’s good for fighting colds and flu I might just keep making it through winter, too. I grind my ginger in the food processor rather than trying to cut it up. I’ve found that I can re-use the ginger pulp after straining either for another batch of syrup or for cooking asian food that calls for ginger. I put it in a jar and pour dry sherry over it just to cover and store in the fridge. The sherry keeps it from spoiling or molding for a long time. That’s a wonderful tip on getting the nostalgic ginger. Thank you for that. I’ll have to try it. Pouring the sherry or any alcohol like vodka over the ginger pulp after making the syrup makes it a ginger tincture and it will keep indefinitely. I’m very excited about this recipe. This is the time of year that I start making elderberry syrup and straining fire cider. Having some extra ginger to use up, I just made a batch of ginger syrup. To get the most out of the ginger and cinnamon stick, I just reused the ginger and cinnamon to start a double batch of elderberry syrup. 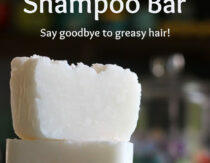 What about using Ginger EO’s instead of dry or fresh ginger? 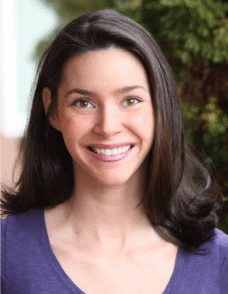 Do not use essential oils in place of whole foods. They are not meant to be taken internally, especially in large proportion. Here is an idea…. 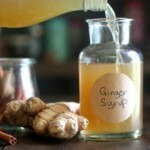 rather than making a syrup right off why not make a GINGER TINCTURE. Do the same with some cinnamon. The tinctures will last indefinitely. Then, when you want some syrup portion out the tincture and add honey to taste. Hi, I saw your earlier comment in response to the sherry. Does it have to be sherry? Or could it be any wine? or a red wine? Thank you for sharing. How much do you have a day? How about your kids? Do you have it only when you are ill? In the Ginger Syrup Recipe, I’m unclear as to how much ginger to use. Is it 1/2 c. of dried ginger or 1 c. Fresh ginger? Or, do you add both? I made this in August for the first time. I placed the leftover pulp (after straining) in a storage bag and froze it to use in stir-fries and smoothies. I accidentally over-reduced my syrup so there’s only about 2/3 cups of liquid left. Do you think it would be better to water it down or just leave it? Thank you! Can essential oil of ginger be used in place of real ginger ? How many times a day should you use cold syrup? And for how many days? I juice my ginger in a juicer then keep it in a jar in the refrigerator. I pour whatever amount I would like in tea, hot water, or cold water. I also save the pulp for cooking with. I save that in the freezer. By juicing I don’t need to peel first, just give it a wash first. I made the Ginger Syrup and love the taste. 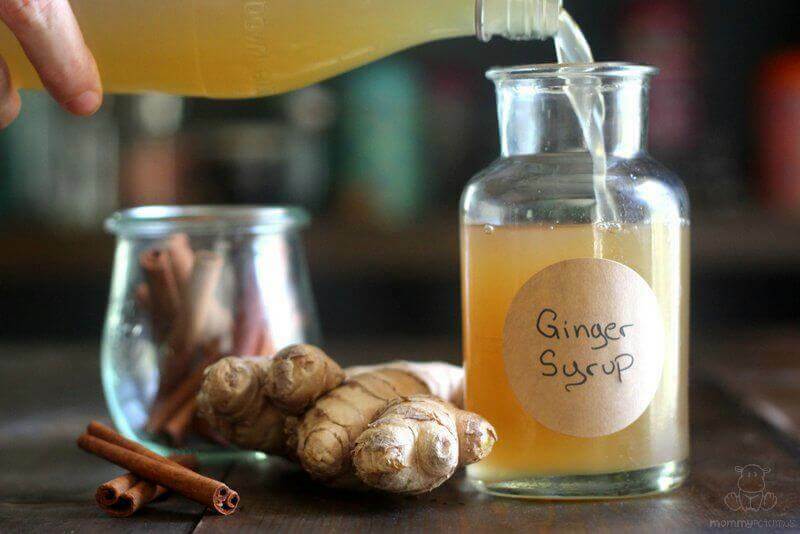 My daughter suffers with migraines and the ginger syrup has really made a difference and she also loves the flavor. I use it for sinus issues and couldn’t imagine a day with out this. Thank you so much for the post. I also look forward to making your coconut oils soap. Does it need to stay in the fridge? I live overseas in the jungle doing bible translation, and we don’t have refrigeration. Yup, it needs to be refrigerated unless you’re going to use in within a few weeks. One of my sons had his go bad (still tasted fine) when kept in his pantry for a couple months….he and a friend had cramps and sweating–not pleasant. A good measure for preservation is equal amounts honey to brewed liquid. Is there another sweetener that I could use instead of honey? Maple syrup? Honey is traditionally used because it is thought to extend the shelf life. I don’t think I would use maple syrup unless I was planning on using it all in a few days. My son is allergic to bees and I haven’t tried to give him honey since he was stung…would you have any other recommendations for an alternative? Hi! A great alternative for your son would be to use beefree honee. I’m vegan, so this is what I use. It’s made from apples. SO you don’t drink this straight? You add some(?) per your taste to some tea or hot water? ?